Shain's personal blog about plant-based health, mind/body/spiritual wellness, and a desire to serve others. THIS IS YOUR LAST CSA DELIVERY FOR THE 2011 SEASON. This week's share is brought to you by our wonderful friends and farm helpers Joyce & Vern, with the assistance of our regular crew of amazing workshares. I've been unable to do farm work for a little over a week now and these people have really gone the extra mile to continue harvesting a bounty of food for you. (I'm fine, just pushed myself too hard trying to be SuperFarmerGirl.) I am deeply grateful for people who are willing to step in and cover my responsibilities. The Tuesday Ladies putting together your bags of salad mix. I would also like to thank those who have come on a regular basis these past 6 months to help on the farm. THANK YOU to Nan, Julie, Kathy, Terri, Mary, Bob & Alice, Andy, Bree & Barry, Greg, Derek, and Beth & Steve. This CSA could not operate without the work and efforts of these good people. Thank you also to Doreen who drives a load of produce up to Jackson for us every week. Many times t's been a bugger to get all that food into as few coolers as possible to fit into her vehicle, but we did it. I know how hard it's been for her to unload all those coolers because I had to load them there to begin with. We also appreciate Sharolyn and Brigette for being our pick-up site hosts. I'm very glad to say we had very few problems with pick ups this year and I know it's because these ladies are taking care of their end so it's smoother for me on my end. And lastly, we thank YOU for supporting us and being members of EverGreen Farm's CSA. We've worked very hard for you and feel like this has been our best CSA season in the many years we've been farming. This past week we finished up the garlic planting by covering the rows with straw. Shain says there are over 7,000 garlic cloves planted in rows. It feels so good the have this large project behind us and I am already looking forward to seeing the garlic's tiny green shoots coming out of the soil in the Spring. The weather has been very favorable for accomplishing a lot of our end of the year goals. This past Saturday was a perfect day to get the greenhouses recovered. Here is greenhouse 1 with it's new plastic covering. This is greenhouse 2 waiting for it's new cover that will go on this coming Saturday. These two greenhouses will be the first to be planted with early season, cool weather crops in the Spring of 2012, usually while there are still several feet of snow on the ground. As the season draws to a close, we find ourselves looking back and evaluating what went well, what didn't work, what needs to change and many other variables that go into our farm (which has a huge impact on our family). I will be honest, 2011 has been a difficult year for us. We've dealt with many challenges, one big one after another. (Yeah, another reason my body is in open rebellion right now.) And despite the hard times, we look back and are very pleased with the overall outcome. We worked hard, pulled through, accomplished alot, and did an amazing job! We really WANT to keep the farm plan the same as it was this year; however, Shain and I have realized and firmly decided it has been too much for us. We can not set ourselves up to repeat this pattern of struggle over and over again. Somethings need to change. Which means there will be changes with EverGreen Farm. We will still farm the way we do, still grow great tasting, organic produce but we will do this by honoring our personal limitations and finding balance within more reasonable expectations. We are cutting back somewhere, somehow so we personally are not bearing the majority of the time and physical labor it takes to run a farm this size. Many ideas have been presented and several options are on the table. We aren't making any big decisions right now. We need some time and distance from the farm season to find wisdom and not react from emotion. I will keep this blog updated with our plans for the future. Thank you for a great year. It was a GREAT year! We are very happy with the way our efforts have been able to reach out and bless the lives of so many people. Please be understanding when some of your produce isn't as perfectly clean as you are used to. Our harvest mornings are very cold which makes washing produce quite difficult, painful even. We do most of the dirt removal, but are leaving some of the final cleaning now to you. (Except for the salad. We are still spending extra time on the salad. Because we like you.) You will also notice some produce is looking a little less than ideal. That's because it's almost the end of OCTOBER. Let's face it, some things are showing signs of the snow and rain we've received, or from the hard freezes we get at night. It's not summer anymore that's for sure. Our big garlic planting project was the main focus of this past week. We started breaking up the garlic on Wednesday afternoon and finished planting all our rows by about noon on Saturday. *Huge Sigh* We planted 11 rows in total, each about 200 feet long. That's a lot of garlic. Enough for our 2012 CSA shares, to sell, and with enough to re-plant for 2013. We plan on mulching the long rows this week with a loose layer of straw. We did this last year as an extra precaution to protect our expensive investment in new, healthy seed stock. We are quite pleased with the results of this years crop and don't dare do it any differently, just in case. This year's garlic planting was particularly challenging because we are very limited to where it can be planted. As I've mentioned before, our past crops of garlic were affected by a virus which finally took a fatal toll in 2010. This virus remains in the soil of where the garlic was grown and will remain there for many years. Only time and aggressive cover cropping will cleanse the virus from the soil. (We can plant other crops there, just not garlic.) There is only one section of the farm where we haven't ever planted garlic. It is the newest of all our fields. The least prepared field. The back field with the most rocks, weeds, and compacted soil. Not a good combination, but its what we have. The garlic will grow fine, it will just be extra work from last weekends planting stage to next year's harvest. And yeah, a lot of weeding. And all because WE LOVE GARLIC. We are moving into clean up mode here on the farm. It is our goal to have greenhouse 2 cleaned out by the end of the week. Then moving onto another, and another. We are also walking through feilds, pulling up dead plants and drip tape, gathering garden staples, etc. The pigs are enjoying extra piles of old crops and turning them into a heaping pile of compost. We have two other BIG projects in the works. First, the guys have started building our newest greenhouse. It will be another hoop house just like the style we put into use this past season. Because of it's location it will be known as greenhouse 4 and we'll be renumbering all our greenhouses, again. The other project is that we will be putting new plastic over greehouses 1 & 2. Greenhouse 1 was our very first greenhouse. It is 10 years old and still has it's original plastic covering. These buildings have been through a lot over the years, including: our own mistakes or carelessness (we'll just call it our "learning curve"), windstorms, mishaps with tractors, and a severe hail storm which put thousands of small dents in the plastic that are still visible these many years later on a sunny day. We hope all these projects go smoothly and that the weather holds out so it call all get done. One week to go. 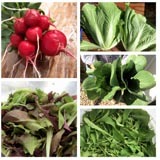 Next week, Tuesday, October 25th will be our last CSA delivery of the 2011 season. Have a great week and ENJOY your veggies. At this point in the season I will no longer be listing that any certain crop is being given for the last time. With the change in the weather especially, there are no gaurantees with anything. Each week brings new circumstances and I find myself adjusting our harvest plans often based on the weather, time, workers, and the overal quantity or quality of individual crops. We still have a wide variety of crops available to harvest and will do our best to give an abundance of vegetables through the end of the month. Our last CSA delivery for the season will be on Tuesday, October 25th. The big news this past week was the SNOW! We woke to a few inches of snow here on Thursday morning and then I watched it snow quite heavily the rest of the day as I went about getting hoopes and row covers out to help protect the tomatoes, salad and other sensitive crops in the greenhouses. That night Shain and I had to evaluate our situation to determine what work could/should be done and if there was anything we could harvest in the cold weather to get a jump on the CSA shares for this week. We opted to harvest all the remaining French fillet beans in greenhouse 2, pulling the plants and tossing them in the pig pen. The plants were loaded! Walking around the farm on Friday, the snow was nearly to the top of my work boots, which by my estimations means we had a foot of snow on the ground! It was a little depressing thinking about all the crops that were frozen or othewise finished off for the season, especially the late rows of peas that had just filled out and were ready to pick a day or two before the snow fell. There's one thing this farm has taught me, that I can't do everything and sometimes I just need to let go...(but I like peas). As the season draws to an end, we invite our CSA members to come glean extra produce from the farm. These are crops which the quantity availalbe is not enough for the CSA, the quality is a little lower than our standards, or the time needed to pick through the crop is no longer practical for our needs. If this is something you'd be interested in doing, please contact me directly. People who are not associated with our farm are also welcome to come glean, but will need to exchange labor or pay for the food they harvest. In a previous newsletter I stated Shain would be planting a fall crop of spinach. This did not happen. There wasn't enough space in the greenhouse for spinach and salad, so he asked a few CSA members and opted to go with planting the more popular crop - salad mix. Much earlier in the season I mentioned that our leek crop for the year would be very small, if any at all. We had received a letter from our supplier that they had cancelled out leek order due to nation wide crop failures. We searched high and low for another source but could not find one. We ended up planting leeks from seed (instead of the usual transplants) with the hopes they would grow large enough to harvest by the fall. It was very confusing at the time, because just that week we planted rows of transplants that looked like leeks, but the letter said they had cancelled our leek order. At this same time, we were also wondering where were the red onions we had ordered. We guessed the supplier had incorrectly sent us a different variety of white onions instead of the red onions and that must have been what we planted. About half way through the season both Shain and I kept looking at these rows of "whatevers" (onions, we had guessed). They looked like leeks. They were leeks. Who knows whatever happened to the red onions we ordered. And the leeks we planted from seed are now barely as big as the transplants we put in earlier this spring. I also wrote before that this year we started raising meat birds to sell. Our plan was to announce their availability for purchase to our CSA members here on this blog just a few weeks before each batch was ready to butcher. We had no idea we'd receive such a high level of interest. All the available chickens were reseved well in advance, some even before they came to the farm as chicks. They were gone before I could even mention it again here. In an effort to be more organized and fair to our potential customers, we have decided to go to a standard waiting list method of distribution. If you want chickens, I'll literally put your name down as the next person on the list. When the chickesn are ready to sell, I'll call the first person, then the next, and go down from there. We hope to raise more birds next year. The first 50 birds raised in 2012 are already reserved. This is going to be very short. I am sorry. Short newsletters means I'm very busy at the farm and with family life. But I know it's really the food that matters most. So here's the weekly list. Thanks! And have a great week! Sorry this post is coming so late. I had to leave town rather unexpectedly for a family matter and was not sure what produce would end up being in the shares this week. So glad to come home and find everything taken care of and that everything was harvested as planned. 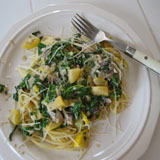 Summer Squash - only for half the CSA, other half next week? From the list above you can see the farm is in full harvest mode. In fact, there are still a few crops we are only beginning to harvest for the first time this season. There's a lot of food out in our fields and greenhouses and we fully expect this CSA season to go out with full abundant shares. We are loving this mild, warm fall weather! We have made a conscious decision to change the way we harvest, clean and package a few of our crops for the rest of the season. Some veggies, like carrots and onions, can be a quick harvest for the CSA if we take a little less time cleaning and sorting them perfectly. We think that extra time is better spent towards harvesting more food. So the onions this week will still have some dirty skins on them. The carrots will be quickly washed and baged instead of nicely bunched (there will even be a few "ugly" ones in the bag that need extra scrubbing or peeling). It's a trade off - a little more work needed on the end of the CSA members at home in trade for more produce in your weekly CSA share. FYI: We will continue to maintain our high standard of double washing the salad greens. - Shain is preparing a new section of ground for us to plant next year's garlic crop. - Now that the farmers markets are over, we will be able to start working on projects like weeding, cleaning old plants out of the greenhouses, pulling up drip tape, etc. - We finally finished digging up all the potatoes. Shain says the overall yield was good considering the cooler weather we had all season. Using black plastic mulch (to warm up the soil and block out weeds) was the trick. Have a great week & ENJOY your veggies!